FACE OF AUSTRALIA High Definition Brown Liquid Eyeliner pen delivers precision colour with the ultra high definition felt tip applicator. For clean, sharp defined lines in a convenient no mess pen application that creates precise definition to the shape of the eye. Create a dramatic statement with a mistake proof application which sets in seconds and is water resistant. The high definition pen offers a mistake proof way to achieve a pigment rich, professional finish that is bold and clean. 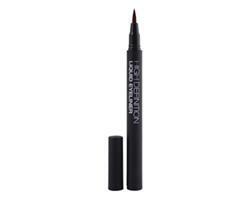 FACE OF AUSTRALIA High Definition Liquid Eyeliner features a precision felt tip pen application that is quick drying, smudge proof and waterproof. Try the Face of Australia Brown High Definition Eyeliner Pencil.